I’ve always loved proof copies, genuine proof copies that is from before the recent publishing phenomena of issuing limited edition “proof copies” as manufactured collectables. To me, manuscript aside (love them too! ), the proof is as close as you can get to the author’s warts and all original text in book form. Pre-1970 UK proofs were nearly always in house documents, produced in small numbers purely to edit, polish and finalise a text ready for print and future publication. Despite being a dustwrapper man, in a dustwrapper business, there is something very appealing about the utilitarian drabness of an [often] buff wrapper offering little or no printed clue to the contents, perhaps an ink stamp or manuscript note concerning state (corrected or uncorrected) or proposed publication date and price. Often discarded once they had served their purpose, these ugly ducklings of the publishing trade have long been unappreciated for their importance and comparative rarity. 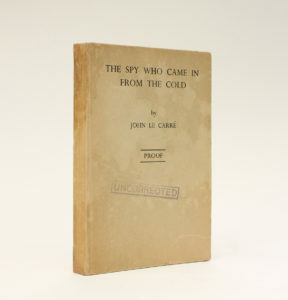 It is highly likely that fewer than 20 proof copies for the then unknown author John Le Carre’s first book will have been produced by the publisher, and fewer than that will have survived today. We have only ever seen one, and been lucky enough to own it briefly twice. This was the novel that introduced George Smiley and the beginning of a literary career that spans 57 years and 24 novels which have been translated into 36 languages and adapted for film, television and radio. 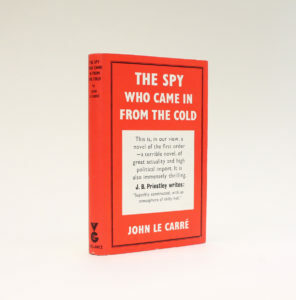 The author’s best known novel, and first international bestseller, is The Spy Who Came In From The Cold. 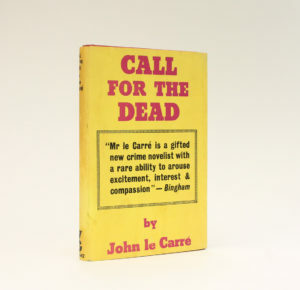 Published in 1963 the book won both the Gold Dagger award (from the Crime Writers’ Association) and the Edgar Award (from the Mystery Writers of America) for best novel, the first work ever to win both titles. On the 50th anniversary of the Dagger Awards in 2005, The Spy Who Came in from the Cold was awarded the “Dagger of Daggers”, a one-time award given to the stand-out novel among all 50 winners over the history of the Crime Writers’ Association. The novel, in 1965 received early film treatment starring Richard Burton. This is the uncorrected proof of that breakthrough novel and the only one we have ever seen or are aware of. Interestingly though we have seen the proof dustjacket twice, both times without the book, one turned up at a London antiquarian bookfair wrapped around a regular blue cloth first edition (snapped up by a quicker bookseller than I) and the second was contained within in the Victor Gollancz archive of correspondence between the author and publisher (sold by Rick Gekoski). The proof state dustwrapper is immediately identifiable by it’s colour, it is yellow as with the two previous novels whilst for the first edition they actually went with red. The author has bequeathed his entire literary archive to the Bodleian Library in Oxford. The archive which filled the space of a Cornish barn includes drafts, manuscripts, photographs, correspondence and one would imagine (although not noted) proof copies. 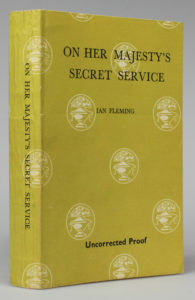 The importance of proof copies in the publishing process is well illustrated in this copy of Ian Fleming’s On Her Majesty’s Secret Service. Having completed and amended several typescript drafts, his novel was passed to the publisher to produce the uncorrected proof copies. By this time Fleming and James Bond were huge so the print-runs for the proofs and first editions increased massively. In this case Cape issued 500 copies on October 1962 (compared to as few as 20 of Casino Royale, although the exact number is unknown). As with previous novels one copy was sent to Aubrey Forshaw who was head of Pan Books (publisher of the James Bond novels in paperback) but more importantly Ian Fleming’s expert for technical information concerning James Bond’s cars. He was asked by Fleming to read the proof and correct any errors relating to the car. Aubrey’s corrections appear in pencil to the margins with further corrections, suggestions and typographical errors noted throughout. He then sends the marked up proof back, in this instance to Michael Howard who was head of Jonathan Cape and he sees to it that all of the corrections are adopted into the first edition text of the published book. So the proof becomes part of the manuscript without which, the book as we know it wouldn’t exist. A grateful author on receipt of his newly published novel sends a copy to his friend and collaborator, inscribing the front endpaper in blue ball point pen “To Aubrey / who wrote some of it! / from Ian”. There are some instances when a finished book might never make it to publication whether for legal, personal or political reasons. 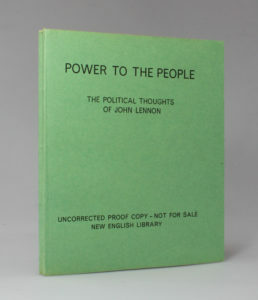 In 1972 London publisher New English Library embarked a book called “Power To The People: The Political Thoughts Of John Lennon” compiled from interviews given by Lennon over 1970 and 1971. The project made it all the way to uncorrected proof stage with original artwork for the dustwrapper and internal illustrations commissioned and print ready and a publication date slated for April 1972. Given John Lennon’s popularity at this time it would have almost certainly been a bestseller but for reasons unknown, publication was pulled at the last minute. This copy belonged to the NEL editorial director Peter Haining and laid in is a note by him, signed and inscribed “The compiler of this little opportunist book which was never published!”. Of the handful of copies known, this is the only example to have the Tony Lamb proof cover artwork. So there you have it, the best John Lennon book never published! The proof is a genuine working document, an essential piece of the process in that book’s history and in owning it, to my mind you are infinitely closer to the author and their original text. That’s why I love them. To see a list of proof copies available on the Lucius Books website click here. It’s Tuesday, and the hottest day of the year so far brings day one of set up at this year’s AFE. We did the fair for the first time last summer in what is usually a quiet time of year for us booksellers, so we are back for another go. 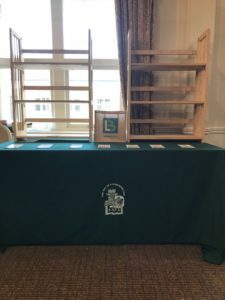 Set-up is two days long (including vetting), which makes for a relaxed atmosphere and the opportunity to move things around the stand until you find their place (no, it’s not just me! ), and to take time out to wander the venue as other stands take shape. The frenzy of set-up at a bookfairs often means that you don’t get the opportunity to really look around for fear of missing a bargain in the next booth, so to be the only bookseller here means I can saunter rather than sprint and in doing so a number of things catch my eye. Top of the list are a couple of children’s toy push carts dating from the 1920s, in entirely original condition, with great paintwork and all the nicks and chips you’d expect from nearly a century of service. 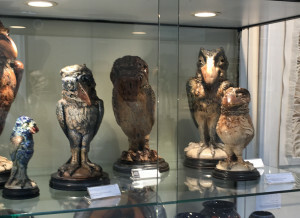 They are fabulous, to be found on the stand of Chester based Mike Melody Antiques. Next up on the stand of Andrew Muir is this Louis Wain ceramic. 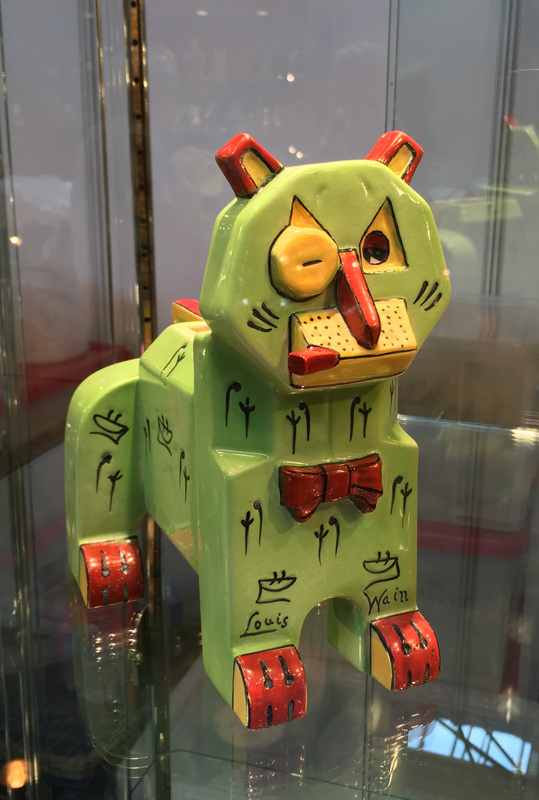 Years ago I used to collect all things Louis Wain and had several of these futurist / deco ceramic characters; cats, dogs… a pig! but never this handsome fella. 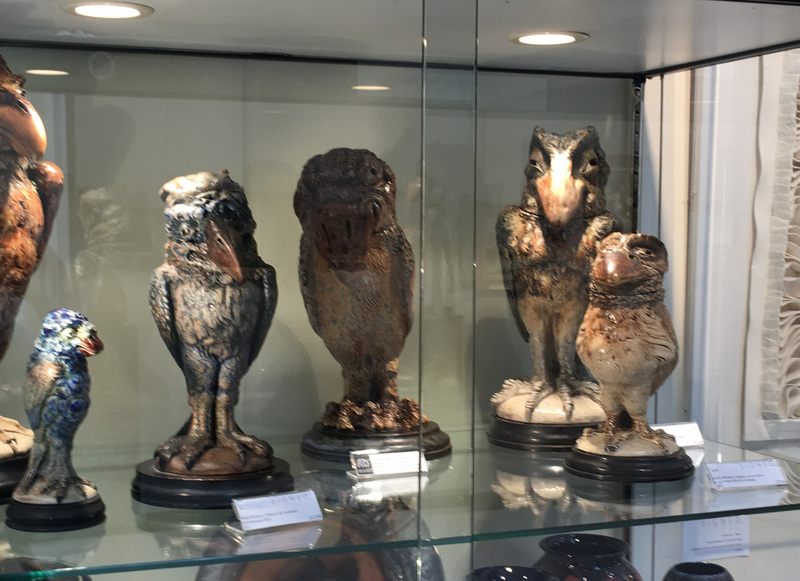 On a similar Marmite-ceramics note, our neighbours at Signed and Designed have an impressive selection of Martin Brothers Grotesque Birds. I’ve always liked these, for similar reasons to Louis Wain’s cat paintings; it’s the character the artists manage to put into the faces. Each one is different, but all have a terrific sense of mischief. 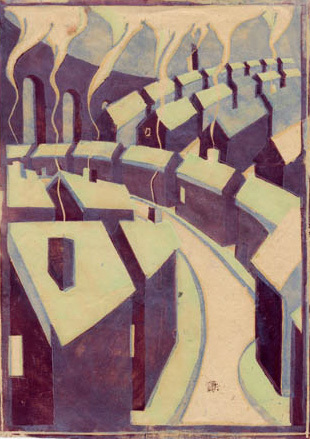 For the wall, my pick would be this proof linocut “Progress, Road In a Mining Town” by lesser known Grosvenor school artist Ursula Fookes. Although she was exhibited during 1929 – 1931, her works were unknown to members of her family until after her death when a cache of prints, paintings and drawings were discovered in a locked room. The selection of furniture on offer is vast and hugely impressive, not least for the logistics and assembly involved- note the fully operational garden fountain and 7ft carved oak corpus Jesus Christ. The variety of dealers and stock at this fair makes for a very different vibe to the bookfairs we usually exhibit at. The [relatively] high number of potential customers coming through the doors brings an opportunity to take what we do to a new audience, to inspire new collectors. I know that walking around the fair for the last two days I’ve found numerous items I never knew I wanted! Our stand is now set up, the vetters are vetting and tomorrow morning at 10am the fair opens to members of the public. This year at school the Head of the Careers department encouraged everyone in my year to take part in a week of work experience after finishing our GCSEs. English and books have always been a great passion of mine, so from the beginning I knew something related to that would be ideal. Luckily I did not have to search too far as my Mum said she knew a family from her work at a school nursery who owned a bookshop that specialised in rare and antique books. I got in touch with James and he and Georgina were kind enough to accept me into the shop for a week following my exams. I learned a lot of things during my week at Lucius Books about the buying and selling of books and how to judge the value based on the condition of the book. It was a job I knew little about before my week, but one I found to be different to anything I have ever heard of as well as being really interesting. One of my tasks during the week was to research the life of George Orwell, a topic which was fascinating. I always enjoy learning about the inspiration behind novels, and how the author’s lives affect their writing. Reading about Orwell’s life inspired me to read the works I now knew so much about, and I recently finished reading 1984 (which I found to be extremely eye opening if a little depressing!). Another highlight of the week for me was a Bonhams auction, in which James was brave enough to let me bid for a couple of items, including one amazing item which after a long and tense battle we won (but am not allowed to say anything more about)! The week allowed me to learn so much about the antiquarian book business and has opened up a career path to me that I may have never even considered otherwise. I would like to thank James and Georgina once again for giving me the opportunity to help out in the shop, and for their and Monica’s kindness, patience and dozens of cups of green tea throughout the week! Most booksellers develop a checklist for cataloguing books. Has it got a front cover, a back cover, a spine, some pages in between, are they all attached to each other, what colour is it, when was it published, by whom, is it in good shape… We’ve catalogued thousands of books, each time running through this checklist and noting each point so that someone reading the description can ‘see’ the book without actually seeing it. We always look for bookseller’s labels, library stamps and inscriptions. I must have typed ‘previous owner’s inscription to front free endpaper’ hundreds and hundreds of times. Inscriptions, unless the book is inscribed by or to someone of note, generally detract from the overall condition of a book. Some collectors aren’t keen on them, either for the simple reason that the book is less ‘clean’ when it has been written in, or possibly from a more complicated sense that the book has a hidden story. Most inscriptions are fairly muted, casual, even; ‘for – , with love from –‘, and maybe a date. They don’t paint much of a picture, these unfamiliar names and formal dedications, though buying and presenting a book is so often a careful gesture, one given serious thought and consideration. The handwriting often conjures more of a story than the inscriptions themselves; a rounded, girlish hand but a man’s name, or a deliberate, childish hand, inscribed to a grandchild. My young daughter has been working her way through the novels of Roald Dahl and is currently engrossed in The Famous Five (she is adamant Enid is a man’s name and thinks I am trying to trick her when I assure her Blyton was a woman.) She chose a book of animal stories from her school library which reminded me of a trilogy of books about a family of foxes I had read while growing up in Ireland. Thinking she might enjoy them but not having come across them in the many years since I read them, I had a look online to see if there were any copies still around. They are out of print now but were reprinted several times so there are plenty of them for sale. I found all the dealers with each of the three books in stock, found the most likely edition that I’d have read and bought the cheapest copies in nice condition. They arrived this morning, not looking like much. I’d managed to buy one in a different edition so they weren’t even uniform and all three, published in the mid to late 80s, are now browned and dog-eared and with the feel of long years in storage in a box in an unheated building. I recognised the cover design of two of the books and felt the pull of my own childhood, but was also a bit professionally disappointed by their condition. Running through my checklist, I noted a previous owner’s name in the first volume. The second was very browned, but with no inscriptions. I opened the third and there, at the top of the page, was my mother’s handwriting. ‘For J- H-, with fondest love from Mummy, Christmas 1988.’ My mum, to my brother, then aged ten. I have bought the very copy I read as a child. We moved to the UK soon after that Christmas and the book must have been donated, or sold, or given away around then and somehow, nearly thirty years later, ended up in a book depository in Milton Keynes to be bought by me for 66p for my daughter. Of course it isn’t impossible, and this isn’t the first time such a thing has happened, but the world swayed for a moment while I tried to account for it. All the inscriptions in the books I catalogue every day bind two people together. Each formulaic dedication conceals the story of a relationship. My tatty paperback, inscribed by my mum, has no real significance or consequence, but it is strange, it has a force- small, and personal, but I will never catalogue an inscription in a book again without wondering, for a minute, about the story it doesn’t tell. The thrill of the chase has always been a strong motivation in the day to day running of our rare book business. 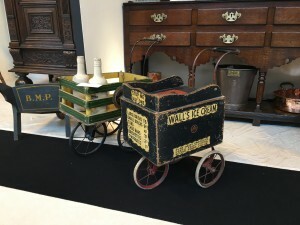 Whether it be attending an auction, studying dealer catalogues or jumping on a train, plane or automobile to follow up a lead, it’s always been the thrill of the chase. But part of the advantage of a very busy fair schedule and having an open shop is every now and again something great comes to you. It started with an email from a gentleman who had inherited some books and was interested in finding out more about them. The collection was formed over a 60 year period by Sir Richard Gregory, and had remained in the family by descent. The name Sir Richard Gregory was not one I was immediately familiar with, but the author of nearly all of the books in the collection was someone most of us would know immediately; H. G. Wells. We were advised that Sir Richard and H. G. Wells had been good friends and that most of the books were copies that the author had given to him. I was invited to view the collection and after a little research and receiving a few grainy images of the shelved books I was intrigued and set off to have a look. Arriving at the house I was shown to the bookcase where I spent the next hour and a half going through each and every item. Most were indeed presentation copies with H. G. Wells’ penned inscription to nearly every one. There were around 90 books in total including the obvious highlights- The Time Machine, The War of the Worlds, The Island of Dr. Moreau- as well as his lesser known titles and the occasional offprint. Laid into some books were bits of typescript, autograph drafts and a letter. One notable absence was The Invisible Man; well, I couldn’t see it anyway. What was very quickly evident was that each book was a genuine presentation copy, inscribed and dispatched on, before or very close to publication. All of the first editions were in their earliest issue states and where H.G. 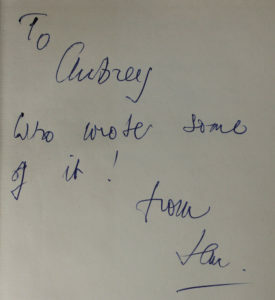 was unable to inscribe or send the book himself he made sure the publisher sent a copy with his compliments. 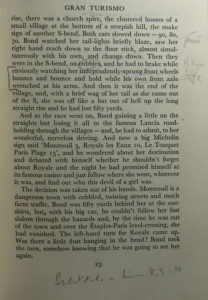 There was a mix of UK and US editions, not necessarily in the order of first publication but, as some of the UK and US editions differ either in text or illustrations, we assume the copy sent was the edition Wells was most happy with. It was clear that Gregory was someone very important to Wells and vice versa; the books spanned Wells’ entire publishing career. I asked the owner about the missing Invisible Man, wondering if perhaps it had been retained by another family member. He had no idea what had happened to it but was pretty sure the collection had remained as is for decades so it was unlikely to have been removed. I relayed my enthusiasm for the collection and explained that there was almost certainly, although I didn’t know it yet, an interesting and possibly important story around it. I advised that the collection was a valuable one and that should it be for sale, we would love to buy it! I left the house with a bid on the table and wondered as I headed home with rain battering the car whether I would ever see the books again. It took a while but several weeks later I received word that if our offer of purchase stood then the collection was ours. Thrilled! we collected and the research and cataloguing process began. The only real itch to scratch was this missing Invisible Man. Why wasn’t it here? We searched auction records, dealer catalogues, online, for any reference to a copy of the Invisible Man inscribed to R. A. Gregory, RAGs or even Gigglecrums, but drew a blank. We found reference to Gregory’s papers at the University of Sussex library; no books were held but his documents, letters and manuscripts were all there. We then turned to biographies both of Wells and of Gregory. Nearly all biographies of Wells have significant reference to Gregory and the biography of Gregory a whole chapter dedicated to H. G. Wells so there was a mountain of information to be had. Bingo! In a letter from Gregory to Wells in February 1898 after reviewing The Invisible Man for ‘Nature’ and ‘Academy’ magazine he writes “I have retained the Academy copy of the book so you need not worry about sending me one”. Presumably the copy was later returned to the Academy but as far as presentation copies go, The Invisible Man was never there. Mystery solved, we set about the details of what proved to be an extraordinary relationship and two exceptional careers. Richard Gregory and the “small, shabby hobbledehoy called H. G. Wells” first met whilst they were pupils at the Normal School for Science in South Kensington. It was here that Wells co-founded and edited the Science Schools Journal assisted readily by Gregory and a life-long friendship was born. Gregory was the author of many books including three text-books, the first of which, Elementary Physical and Astronomical Geography, published in 1891, ran to seven editions. His fourth, a biology course book entitled Honours Physiography  was a collaboration with Wells which, on account of mutual financial embarrassment, they sold outright to the publisher for £20- splitting the proceeds down the middle. Gregory’s enthusiasm for science was rewarded in May 1893 when he was appointed by Norman Lockyer to the staff of the prestigious scientific journal Nature. As Wells settled down to write essays in the scientific occult like The Time Machine and The Island of Dr. Moreau he would often turn to Gregory for encouragement. That Gregory would take advice and seek the support of Wells for his own work indicates the reciprocity of feelings and interests between the two friends. They were each, in their own way, doing essential work for science; Gregory concentrating on the exposition of the laws of Nature, Wells on their imaginative exploitation. Wells, with his romances of science, did for generations what Gregory could never do: he unlocked the imaginations of thousands, and buoyed them with new hope. In 1919 Gregory took over as editor of Nature, establishing it in the international scientific community. He introduced weekly editorials on social and political issues, so much so that Nature was dubbed “the most important weekly written in English” and banned in Nazi Germany for criticising the expulsion of Jewish scientists. Memorable moments in science under Gregory’s editorship included the discovery of the neutron and an entire special issue devoted to Albert Einstein’s theory of relativity. Wells wrote for and was reviewed extensively in Nature. He considered it an ideal platform to convey his ideas to an influential audience. Despite decent scientific credentials (first-class honours in zoology and second-class honours in biology), he never managed to obtain a much-coveted Fellowship of the Royal Society and thus wrote as an outsider to the scientific establishment. From their 1886 first meeting at the Normal School for Science up until Wells’ death in August 1946, Gregory and Wells remained in close contact and the best of friends. Indeed it is recorded that Gregory is the only person with whom Wells never quarrelled. Even after Wells’ death, Gregory worked tirelessly in trying to “keep alive this considerable body of thought”, attempting to form a Wells Fellowship (the Wells Memorial). The papers of Sir Richard Gregory reside at the University of Sussex Library (Special Collections). The archive was donated by Lady Gregory in April 1970. James bought the photos but I hadn’t seen them until we collected them in London. We took them to the café on the ground floor of the Royal Academy. The lighting is poor and the couple at the next table were discreetly trying to see what we were looking at: cellophane packs of photos, unmistakably early colour, with the rounded corners of family snapshot albums. They were also unmistakably American. Unmistakably New York. The pictures were printed at a time when mass market colour photo reproduction was so new that developing one roll of film cost the equivalent of an average week’s wages and the film had to be sent away to a lab to be processed. They are across-the-street shots of general stores, liquor stores, butchers, pharmacies, cinemas. There are a few chains, like Dilbert Brothers, but mostly they are independent businesses. None, so far as we know, still operate today, although some of the buildings still stand. There are 57 photographs, no duplicates, though in some cases there are multiple shots of the same store. Laid out on the floor at the back of our shop, I walked away from them and back again, time and again, trying to trick them into giving up their story. This was an expensive project, but the set up for the photos is almost matter-of-fact. Parked cars obscure parts of some photos, passers-by, or their reflections, are captured hurrying past. They were not taken by someone concerned with flawless composition or even deliberately trying for a reportage style. They record information, nothing more. Window displays, cinema foyer, clothing displays. You can make out the sign for the dentist on the first floor of one shop, and the figure of a man hunched over a restaurant counter in another. I can’t help feeling it’s a portfolio concerning metal. The post-war transition to mass production. Aluminium. Aluminium frames around glass store windows and doors. It documents a time where main streets were dominated not by chains of shops or mini-hypermarkets but by small, specialist, often family-run stores. Laid out together, a narrative of sorts builds. Like Twentysix Gasoline Stations, the photos offer no commentary, they simply present themselves- with the barest details of name and location- and eventually add up to more than the sum of their parts. That’s why we used the format of Twentysix Gasoline Stations- they fit perfectly. We didn’t even change the size of the images. 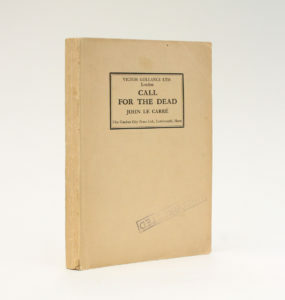 The edition is limited to 75 copies and will be launched at the New York Antiquarian Book Fair in April. 29th January: Setting off for two bookfairs in California, our books in shipping trunks were dispatched a week ago, now it’s our turn to head over the pond. 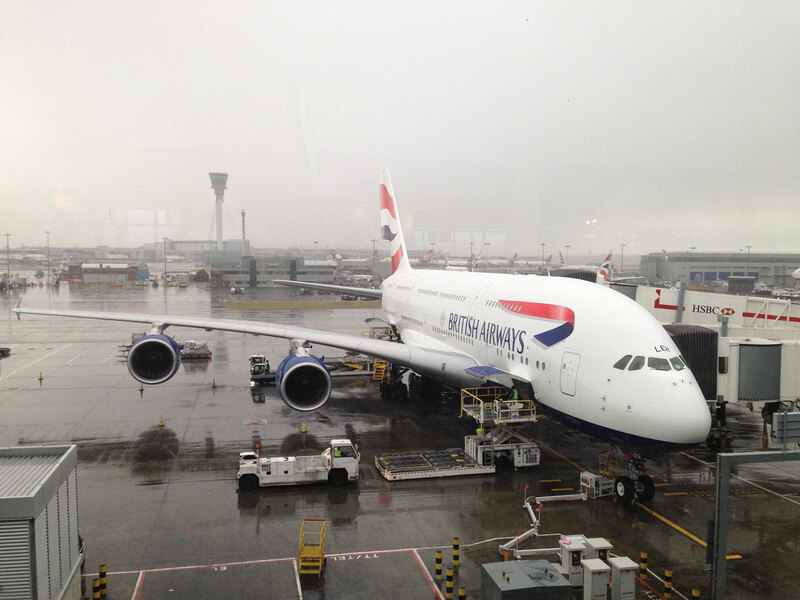 We arrive at our gate to find our aircraft for the 11 hour flight to Los Angeles is a brand spanking new Airbus A380, the double decker and one of the most efficient passenger airplanes in the sky. Despite my best efforts and obvious excitement I was unable to enthuse Georgina about our lucky break! New machine-based facilities at LAX meant that we were through immigration in record time and at the baggage belt before the suitcases. Phone on. 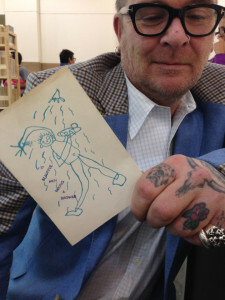 Message from Lucius Books consultant James Allen who had come out the day before to scout the LA Art Fair to call him asap; by the time our bags arrived we’ve bought our first book. The 1964 self published first edition of Yoko Ono’s GRAPEFRUIT was printed in Tokyo in an edition of 500 copies under her Wunternaum Press imprint. 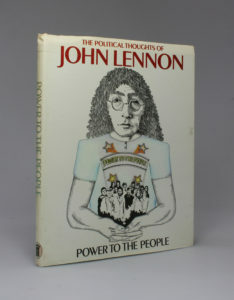 Most will know of the later edition in which John Lennon wrote an introduction and contributed a couple of line drawings but this Tokyo edition precedes Yoko and John meeting (at the time of publication Yoko was living in Tokyo with her American husband Tony Cox and their baby daughter). 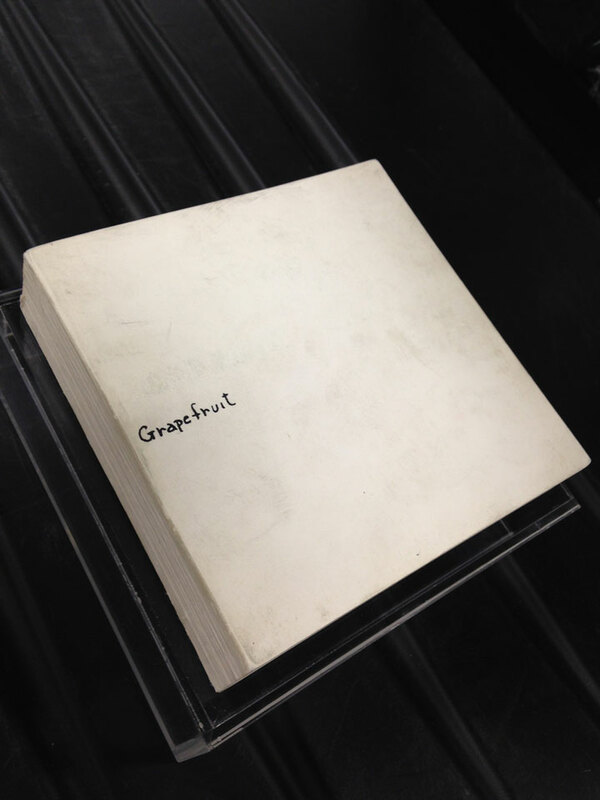 This groundbreaking conceptual piece made up of [in Yoko’s own words] “instructions to help you through life” in its plain white paper binding with the author’s hand-written title in black ink to the upper cover is tough to find, and even tougher in decent condition. But that’s just the start of it…. We pull up at our hotel in Pasadena just under an hour later and despite it being 4am UK time we decide a slice of pizza and a glass of wine is in order. A brief flurry of text messages ensues and before we knew it we are glass in hand with our pals Pom Harrington and Paul Foster catching up on what we’ve missed (evidently several bottles of wine!) – Set up at the fair starts 8am tomorrow so we call it a night. 10pm (that’s 6am UK time- go us!). Employee of the month: James Allen (35), counter culture, fashion, photography. He looks calm and collected but inside he’s dancing. Booth 301. Cabinets are in place, shipping trunks with our books in are here. I scarper, making circles of the fair as people are unpacking, eyes peeled ready to strike at the glimpse of an interesting book or object. Barely 15 minutes in and we’ve broken our duck: an attractively bound set of the Brock illustrated Jane Austen, complete in 6 volumes. Bumped into James A doing a victory dance having purchased for Lucius a photobook he’d been searching for for years and never seen before – something to do with naked men, in showers, accordian bound: nuff said. Purchases are piling up and with every circle of the fair I pop by our booth which in Georgina’s hands is shaping up quite nicely. Saturday: doors open and a good crowd, very pleased to see some of our local customers and always good to put faces to names of the people we have previously sold books to either online or by telephone but until now never met. 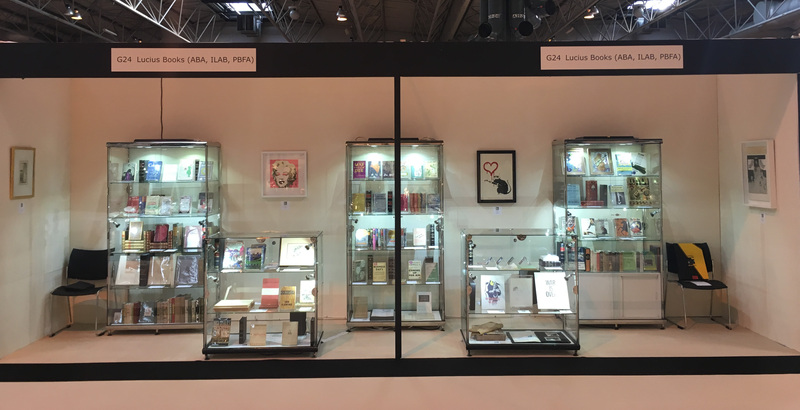 There are rumours of a major Hollywood director walking around the fair, and we spot a few actors and musicians, many of whom are serious collectors and regulars at the major Californian book fairs. We make some good sales; popular, as ever are A. A. Milne and E. H. Shepard’s Winnie The Pooh books, and one hardboiled fan walks away with a lovely first edition in dustwrapper of Dashiell Hammett’s The Glass Key. 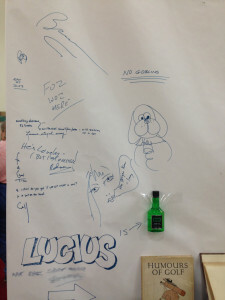 The Paul Foster Wall of Fame (and shame). Contributions from David Bauman, Pom Harrington, Adam Blakeney, Holly Segar, Peter Stern, Lorraine Stern, Georgina Hallgate and yours truly! Pack up goes smoothly, space found for new purchases, trunks locked and off they go for the 48th California International Antiquarian Bookfair. Where the books go we follow so we are back on the road, this time to Oakland with a few stops in between. There is a Lucius Law which dictates that as soon as the trunks of books are collected for an overseas fair, somebody telephones or emails to order one of the books we have just watched loaded onto the back of a van, not to be seen again until we arrive at our stand at the bookfair, usually about a week later. As each book has its printed description slipped inside and is carefully placed into a bubble bag, I wonder whether this will be the one that we’ll wish we’d decided not to take. The second Law of Lucius is that, when abroad for a bookfair, we must have a farcical Challenge Anneka-style mission to courier a parcel to a customer, so the answer is, of course, Yes, we can get it to you by Thursday. We once had to send a set of Tolkien firsts from New York to Kansas on an overnight service. Our hotel concierge assured us they would take care of it. We left the parcel at the front desk, took our tracking information and innocently went to the bookfair, whereupon the parcel fell of the edge of the planet. It didn’t show up on the courier’s tracking facility, the hotel had never seen it or heard of it and nobody remembered it being collected. On the hotel CCTV we could see the corner of the parcel one moment, and a time delay later it had disappeared. The hotel maintained their complete disinterest in the face of our rising panic. Realising it must have been stolen, we set about reporting it to the police. James Googled the local police station and phoned them. “This is homicide. You don’t call this number.” Click. The book reappeared on the courier tracking system four days later, the same day the parcel showed up with the customer. Third Law of Lucius came into force: don’t leave parcels with hotel front desks. Which is how we came to walk twenty blocks through the February sunshine in Santa Monica on Monday morning, looking for a courier we could entrust with our parcel and who could deliver it for less than the price of a return passenger airline ticket. UPS were unable to offer international shipping. Yes, really. Ethan at a shipping brokerage store could offer us many sizes of cardboard box and our body weight in styrofoam peanuts but quoted a shipping price so high he startled even himself with his front. The massiveness of Ethan’s quote softened us up for the only slightly less eye-watering price down the road and we finally got it on its way. It was delivered yesterday, on time. So we are all ready to set up the Oakland fair tomorrow, rocking our Challenge Anneka Lycra bodysuits. Straight from the airport to Stephanie’s on Newbury, just in time for the traditional Boston jet-lag remedy of dinner and cocktails by a roaring fire. We walked from there over the Charles River to Cambridge and into Harvard. Dry, bright, cold. Autumn leaves underfoot and on the trees, reflecting on a burnished Henry Moore sculpture in one of the yards. We then spent an hour browsing in the Harvard Book Store, an independent bookshop selling predominantly new books. I was especially taken with the children’s books they stock – a huge range, many beautifully produced. The quality of paper, illustrations, colour, type all very impressive. Then, because we’re from Yorkshire, we had a cup of tea at a table outside a café. I’ve only lived in Yorkshire for ten years so am not as double-hard as James, but the frostbite on the backs of my legs is in a very pretty pattern from the wrought iron chair. We went to the Boston set up with clear heads and ready for action. The Prudential Centre is a gargantuan building, or series of buildings, connected by walkways and escalators. The Hynes Convention Centre is front and centre and keeps everyone alert with a continual series of electric shocks generated by the carpet. It is always nice to see our trunks waiting for us and luckily the two that were missing were soon located on a colleague’s stand, rather than still in Toronto or prematurely en route to York. The Brattle Bunfight was scheduled for 9.30am. I am usually busy unpacking so hadn’t witnessed it before. Really, it is a sight to behold. Brattle open all their boxes simultaneously and the assembled crowd of ordinarily fairly peaceable and dignified booksellers transform into a Saga Holidays re-enactment of Gladiator: The Movie, climbing over one another, yelling, assembling piles of books to buy and snarling at anyone who mistakes their pile for one of the many other piles balanced on the cabinets and shelves. Eventually, those within the booth are barricaded inside by the towers they have built, and the audience outside can no longer see the action and disperse. The Brattle staff remain serene throughout and somehow parcel up the sold piles, shelve the unsold piles and send the sated and bruised booksellers back to their own booths, bearing their spoils, to apply band-aids and cold-packs.